Refund is not applicable on this product. One time payment and no hidden cost 1 Year free support & updates included but not in modified code. Additional years support and updates will be $19/year No license verification Code sharing is not allowed except within your organization. With the increased risks related to data, a user is prone to feel distrustful of third party cloud storage. With Nextcloud, you can set up your own cloud storage for your public as well as private server. 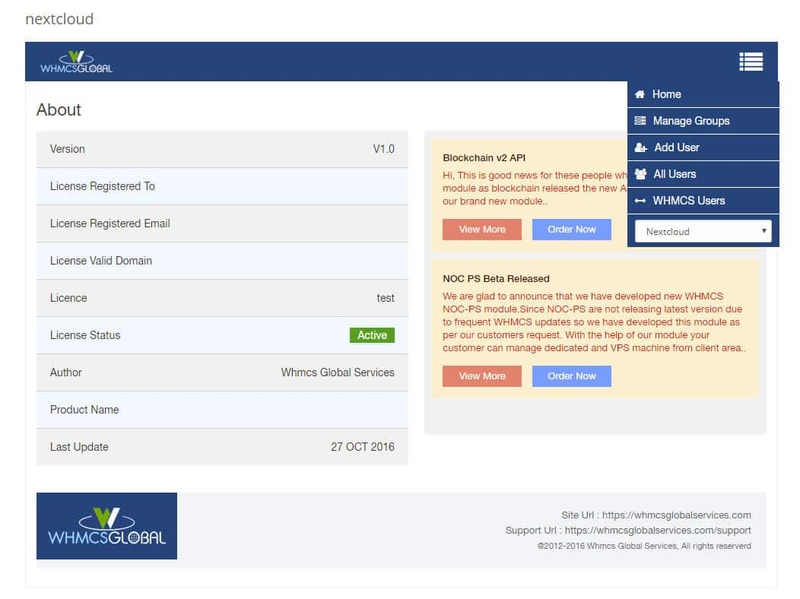 What does our Nextcloud integration with WHMCS do ? It’s a great beneficial module for hosting providers who want to resell the cloud space to their users or who have already sold their cloud storage. With our module you don’t need to do any manual work. 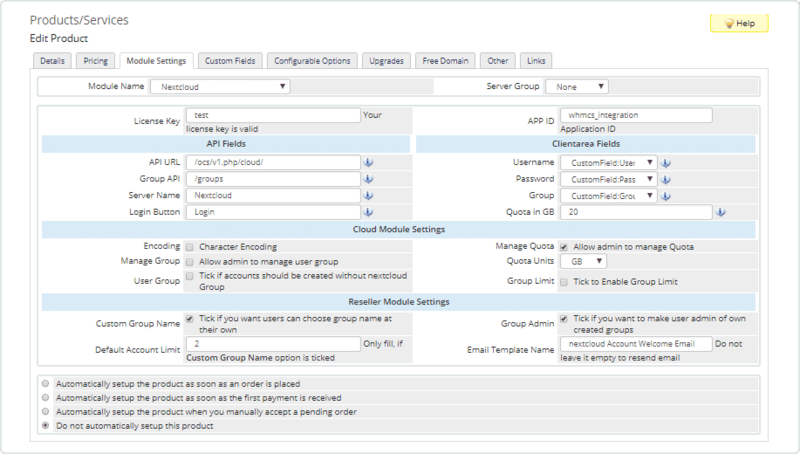 You can create various types of products within WHMCS. 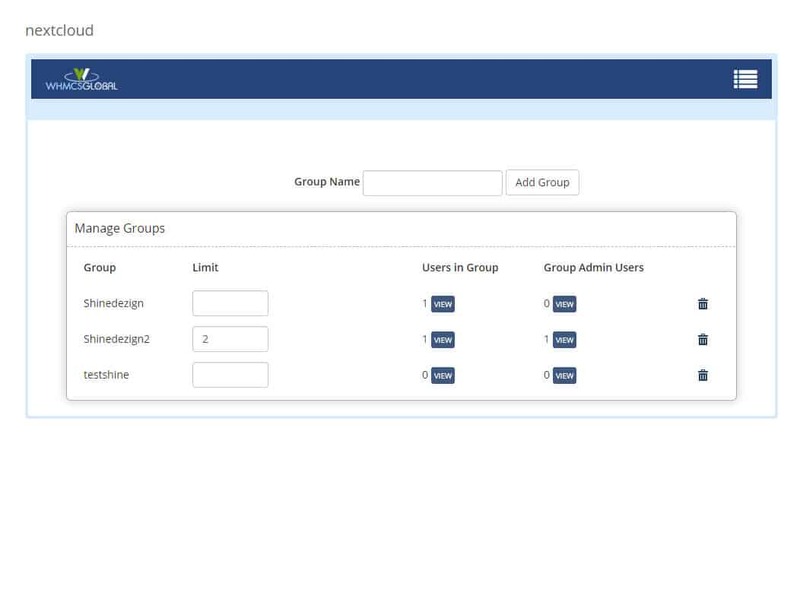 When you buy the reseller package it enables your end user to create a reseller with their choice of group name. It also provides an option to choose space and user account limit as per requirement. Once the invoice is marked as paid, the reseller account and it’s login credentials are sent via mail. 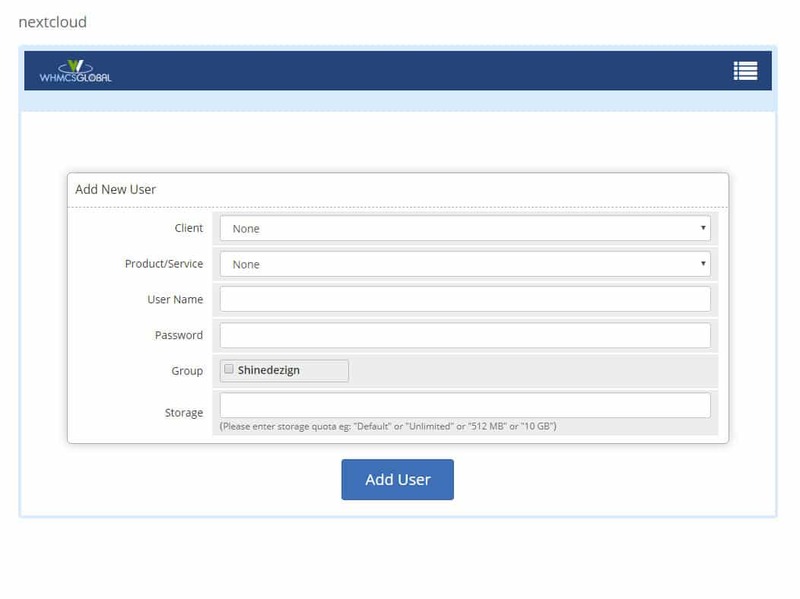 This enables the user to login and create their required user(s). 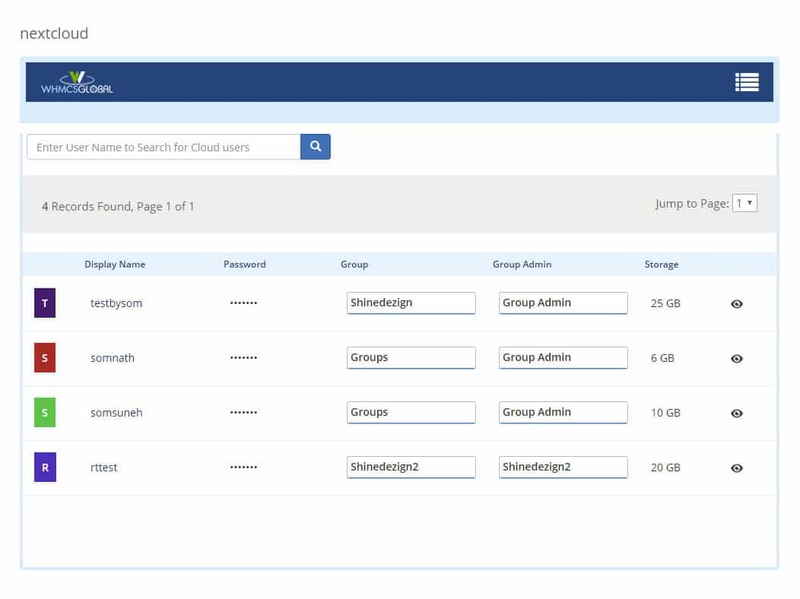 This feature is beneficial for those individual users who need custom storage plans. Here, if an admin wants to sell small packages for example- a single account with minimal space then he(admin) has a choice to let the user customize a group name and quota, or set predefined quota and group name for products by themselves. 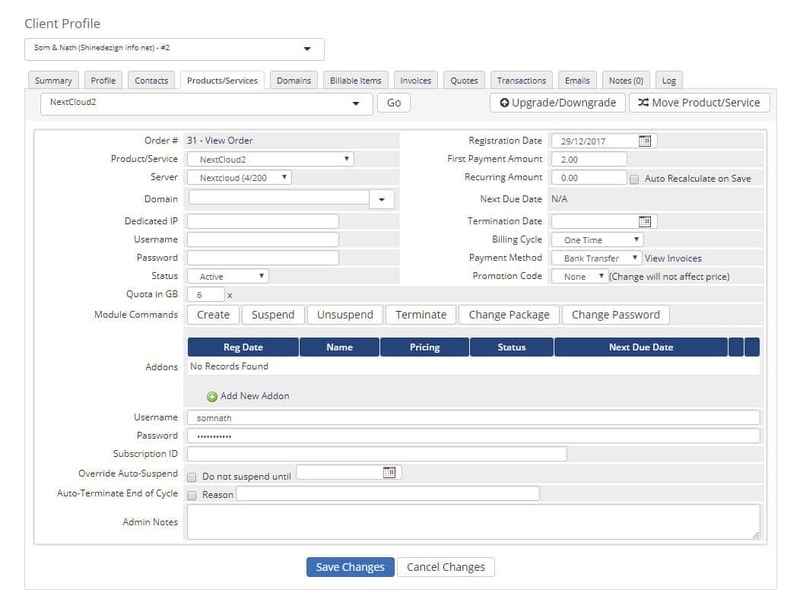 Whenever customer orders an upgraded package an invoice will be automatically generated. 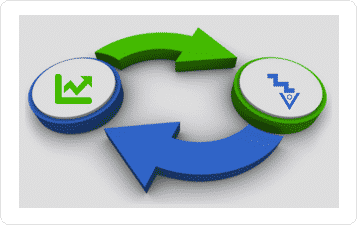 Once the invoice is paid, the user quota is upgraded without any data loss. This is a default functionality within WHMCS. Nextcloud WHMCS App is the backbone for WHMCS module, this app is accountable for communication between WHMCS and Nextcloud. 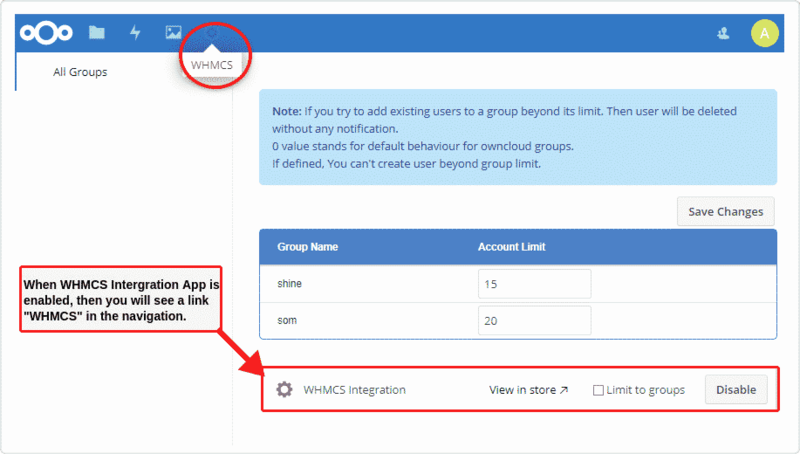 You must enable WHMCS Integration App from your Nextcloud installation to commence. WHMCS link in the navigation panel will allow you to set account limit for groups available in Nextcloud except “admin” group. 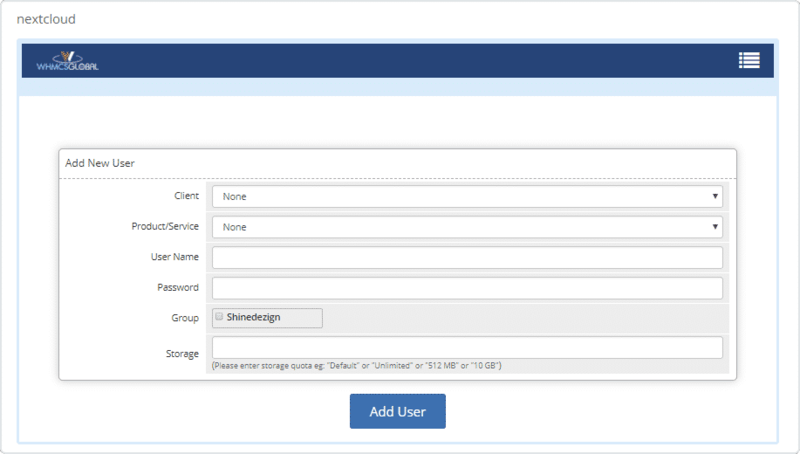 Create Nextcloud account with customer’s choice group and quota. 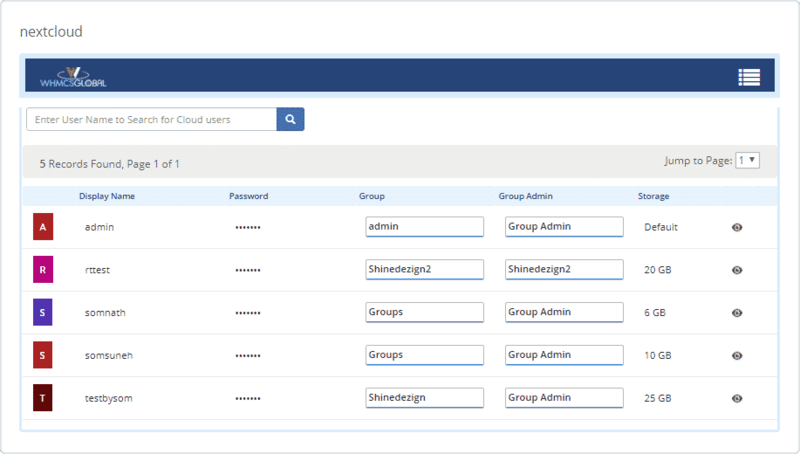 Create Nextcloud account with admin user’s choice group and quota. Create Nextcloud account without group. 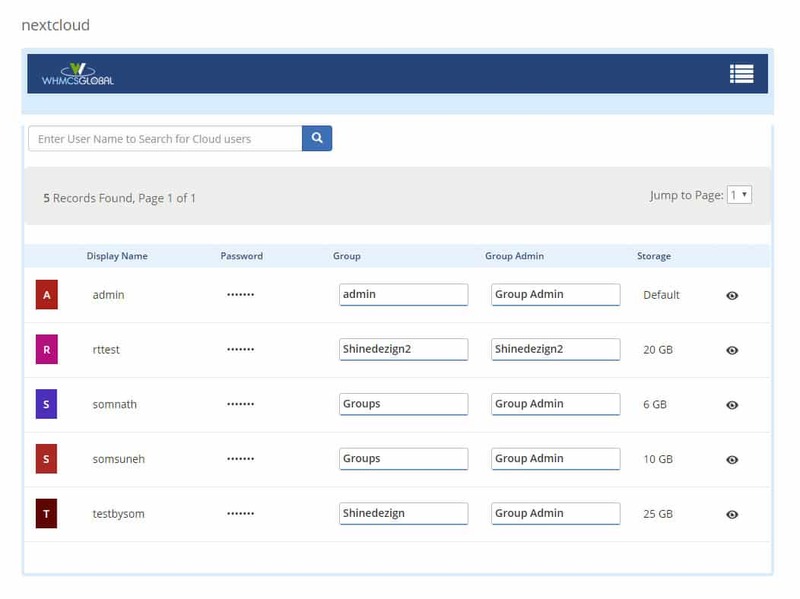 Create Nextcloud account with user’s choice group (will create new) and can set user as Group admin. Account limit for a group on two levels i.e. App Level and Module Level. 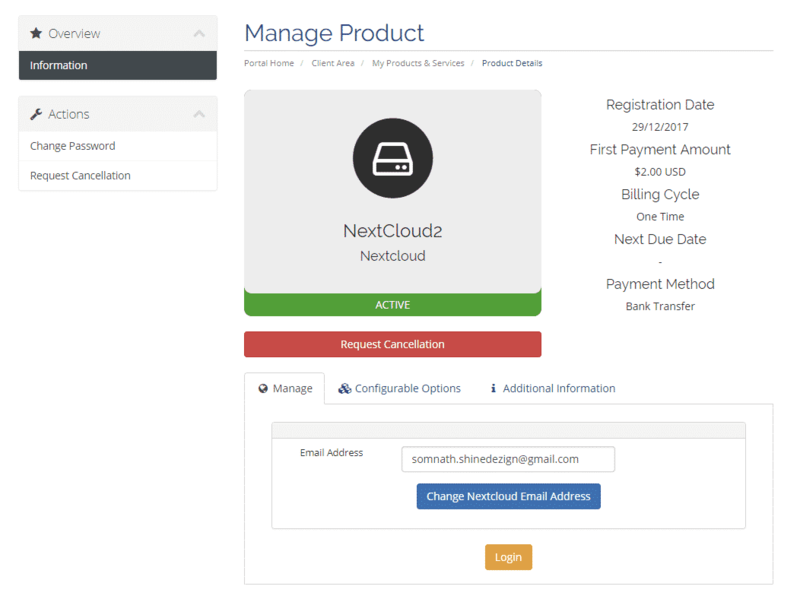 Nextcloud Provisioning Module provides your customers a method to login to their Nextcloud account with a single click from WHMCS client area. 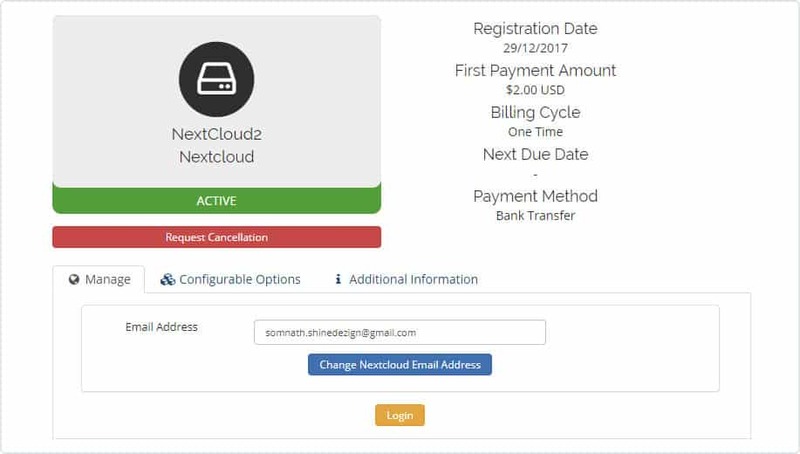 Customer can also alter the Nextcloud email address from WHMCS that receives notifications. By default customer’s email address is automatically added to the customer’s Nextcloud account. This plugin on admin area is a mode to manage all your Nextcloud users, without tapping into the Nextcloud login. Admin can alter display name, password, groups, group admins, delete user etc. The WHMCS Users link on the top right corner of the module (see image) filters users that have service with WHMCS. If you have more than one Nextcloud installations, then both our modules are suitable to manage your several Nextcloud installations. You can add several servers in WHMCS. In addon module on top right corner, you will see a drop down that will illustrate you all the servers with which Nextcloud module is attached. Admin can set limit for groups except main admin group. 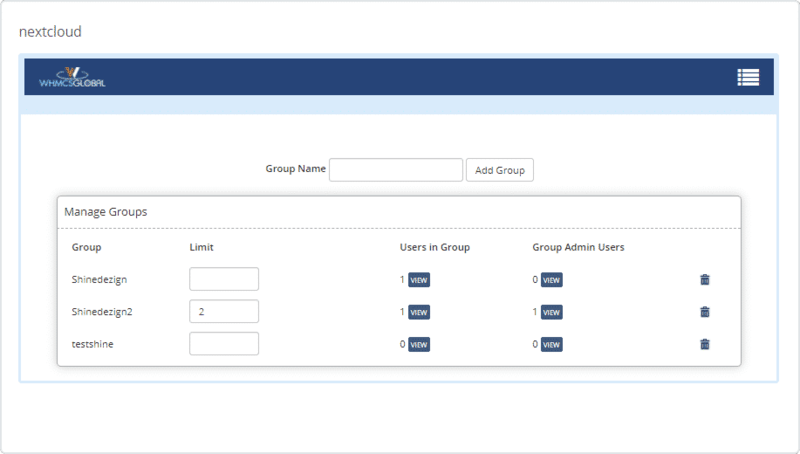 By clicking on view link, you can view users in a group as well as admin(s) of the group. You can also delete idle groups. You also can add order for client for Nextcloud product that you have configured already. If you want to create user only at Nextcloud and don’t want to create order then don’t select any client and product. the module is working and has some nice features, but the updates are slow! "Whmcs Integration APP" will not work with the stable NC 15 Version!!! Would highly recommend this product to anyone in need of a Nextcloud product on their store. Very quick to setup and to get started. Great support. Had a few questions, got answered promptly by the developer. Overall a fantastic module! Module itself is awesome. They are slow in releasing updates though. We recommend whmcsglobalservices they service and product are very good if you are are looking for an good WHMCS developer company. I have buy Nextcloud for whmcs and it work fine, just what I was looking for. For more modules and custom work visit they website. Hi there, is this addon supporting the latest version 12 of nextcloud?